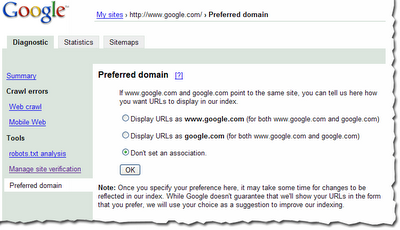 Some webmasters want their sites indexed under the www version of their domain; others want their sites indexed without the www. Which do you prefer? Now you can tell us and we'll do our best to do what you like when crawling and indexing your site. Note that it might take some time for changes to be reflected in our index, but if you notice that your site is currently indexed using both versions of your domain, tell us your preference. Do you like seeing the top queries that returned your site? Now you can download a CSV file that shows you the top queries for each of your subfolders in the results. 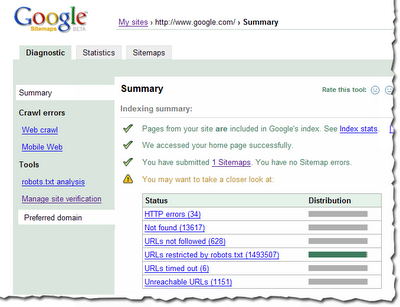 Now you can see at a glance the types of errors we get when crawling your site. You can see a table of the errors on the summary page, with counts for each error type. On the crawl errors page, you can still see the number of errors for type, as well as filter errors by date. If somebody from your team no longer has write access to a site and should no longer be a verified owner of it, you can remove the verification file or meta tag for that person. When we periodically check verification, that person's account will no longer be verified for the site. We've added the ability to let you request that check so that you don't have to wait for our periodic process. Simply click the "Manage site verification" link, make note of the verification files and meta tags that may exist for the site, remove any that are no longer valid, and click the "Reverify all site owners" button. We'll check all accounts that are verified for the site and only leave verification in place for accounts for which we find a verification file or meta tag. You'll find a number of other smaller enhancements throughout the webmaster tools, all based on your feedback. Thanks as always for your input -- please let us know what you think in our newly revamped Google Group. With our latest release, we've done more than just change our name --we've listened to you and added some features and enhanced others as a result.